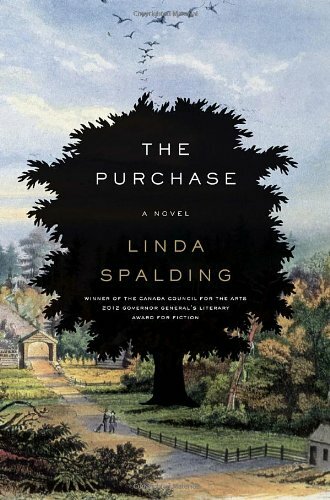 We could say that Linda Spalding’s historical novel The Purchase is beautifully written, emotionally evocative, gripping, engaging, and truthful. If we did say all that, it would be understatement. Were we to empty the dictionary of superlatives and place them all here, they would still be understatements. Set in the early 1800s when the United states was still very young with a brand spanking new Constitution and the noble experiment still in its infancy, Ms. Spalding’s novel quickly becomes emblematic of that most uncertain and unsettling of times. His children, particularly the eldest, Mary, is not pleased, nor is she happy with her new stepmother whom she insists on calling Ruth Boyd instead of acknowledging her as mother. Daniel’s only ambition is to establish a prosperous farm on his land. The first thing he does after finding his property and having it surveyed to establish the boundaries, is build a lean-to as temporary shelter until a proper cabin can be raised. Home manufactures help support the family as each member finds something useful to do. Ruth churns butter and Mary uses folk remedies learned from a slave woman. Slowly, painfully, they begin building a life even as the new country is finding its footing in the world. But it is clear that Daniel is in foreign territory. In Virginia, slavery is the lynchpin of the agricultural economy, and as a Quaker he is an abolitionist. Ironically, and in a way he doesn’t quite understand, he is placed in the contradictory position of being a slave owner. He goes into the nearest town to buy tools for the farm and finds himself among the people watching a slave auction. A young boy is on the block and bidding begins. Without any seeming motive, Daniel’s had shoots up, and he finds himself the owner of a slave, but having no money he has to pawn one of his horses, Miss Patch, to seal the deal. He is caught in the economic trap, the same trap, facing the same question as Thomas Jefferson who abhorred slavery and yet was unable to free his slaves. Southern agriculture based largely on cotton and rice, was labor intensive. The agrarian culture of the south depended on slavery and if one farmer freed his slaves while no one else did, that man would no longer be able to compete economically with slaveholders and would lose everything. In many cases, he would lose land that had been passed down to him through generations. All those ancestors speak with a powerful voice. Daniel inherited his land from his wife. His life was precarious enough and he could not bring himself to lose it. The question must be asked: who among us would reduce their children to penury for the sake of a principle no matter how noble that principle may be or how strongly we believe in it? It is a difficult question fraught with social complexities, moral ambiguities and ethical paradoxes that do not admit any easy answers. Fortunately for the reader, Ms. Spalding resists the temptation to provide us with any. The purchase of a slave is the last thing Daniel actually does to move the plot forward; he is throughout more acted upon than initiating action, which is in keeping with his Quaker background. It is for his children to pick up the action and move it forward. The result is a complex story of racial violence, interracial coupling, forbidden friendships, mixed race children whose ownership cannot be determined, a tangled web of complex property laws, hypocrisy, betrayal and greed. But, there is also nobility of spirit, lofty ambition, loyalty and love. Often these opposing qualities are found in single individuals. What we have is a family of real, multidimensional people, growing from children into adults, shaped by and shaping their world, each dealing with the question in his or her own way, striving to make the country better as it also is growing into its adolescence, stumbling clumsily and inevitably into Civil War. We are equally impressed with Ms. Spalding’s drawing of the characters who populate the neighboring farms and the small village. Where it is often tempting to give these minor characters short shrift, here they are unique and fully realized people, a colorful lot reminiscent of some of the characters of Samuel Clemens. Some you love, some you detest, but none are neutral. Central to the story, though, is the culture that grew up around the institution of slavery. People in the South breathed in the culture as thoughtlessly as they breathed in the hot humid air. It was defended in the legislature and in the pulpit and no one spoke out against it. It was a way of life, a given. If anyone did oppose it openly, that person soon suffered dearly for his insolence. Some of Daniel’s children are absorbed into the slaveholding culture, some surreptitiously resist it. Daniel’s oldest daughter, Mary, is the first to break the code by teaching the young slave, Onesimus shortened to Simus, to read and tells him stories from the Bible and from the Greek myths. John Adams wrote prior to the signing of the Declaration of Independence that if the slavery clause were removed and slavery allowed, in less than a hundred years there would be a civil war to resolve the question. He was not a fortuneteller, he had no crystal ball. He could simply read the times in which he lived when the North and the South seemed almost like separate countries. It is said that a great work of art moves us on four levels: entertainment, instruction, inspiration and enlightenment. Rarely are all four found in one volume. The Purchase is one of those rarities.